Very elaborate beautiful 4 piece bridal necklace and tiara set consisting of necklace, tiara, earrings and bracelet. With this wonderful wedding jewellery look pretty in pink on your wedding day! 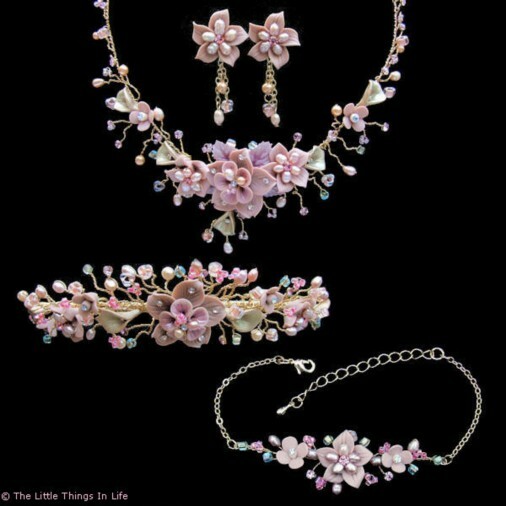 Sizes: necklace length 39cm + 5cm extender, bracelet 18cm + 5cm extender, earrings drop 3cm, tiara 13cm across 3cm high. NOTE Tiara or Necklace set may be purchased separately; please enquire.